In the aftermath of the Great Recession, mainstream macroeconomists have been seeking in various ways to bring the financial sector into their models. As that activity implies, the financial sector had not previously been playing much of a role mainstream models. Claudio Borio lays out a perspective on treating cycles in the financial sector as having a life of their own in "The financial cycle andmacroeconomics: What have we learnt? ", published in December 2012 as working paper #395 for the Bank of International Settlements. I should note that Borio's view of how the financial sector interrelates with the real economy is not conventional macroeconomic wisdom, but I should also note that conventional macroeconomics hasn't exactly covered itself with glory in the last few years. financial “frictions” on otherwise fully well behaved equilibrium macroeconomic models ... The main thesis is that macroeconomics without the financial cycle is like Hamlet without the Prince. In the environment that has prevailed for at least three decades now, just as in the one that prevailed in the pre-WW2 years, it is simply not possible to understand business fluctuations and their policy challenges without understanding the financial cycle." Borio argues that there is a "financial cycle" with its own dynamics. Here's a figure with U.S. data showing the regular business cycle, measured by variations in GDP, compared with the "financial cycle," based on estimates of credit, the credit/GDP ratio, and property prices. 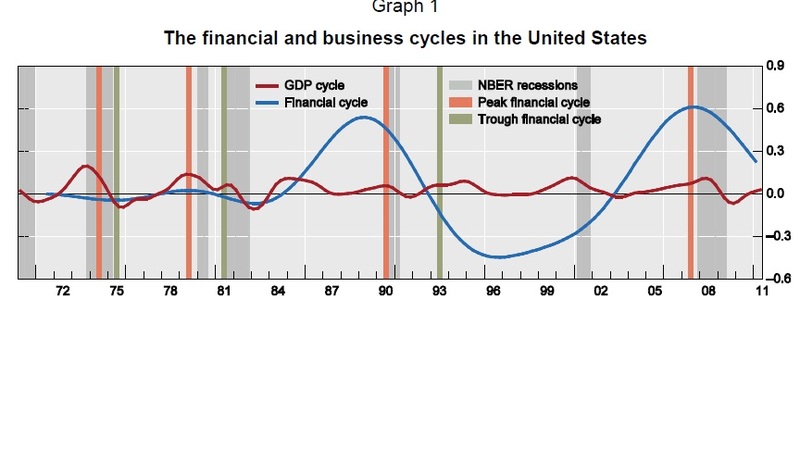 He argues that while business cycles are usually in the range of 1-8 years, "the average length of the financial cycle in a sample of seven industrialised countries since the 1960s has been around 16 years." Borio argues that the peaks of the financial cycle are associated with financial crises. When a business cycle recession happens at the same time as the contraction part of a financial cycle, the recession is about 50% deeper. boom turns to bust and balance sheet problems emerge, especially in the financial sector." However, once the double-whammy of a financial crisis and a business cycle recession has hit simultaneously, Borio also argues that conventional policy responses may not work well. In a "balance sheet recession," fiscal and monetary policy may not be very capable of stimulating demand, and instead may encourage financial firms and businesses to put off the necessary hard steps they need to take, leaving the economy too dependent on government stimulation rather than on the private sector moving forward. As he writes: "On reflection, the basic reason for the limitations of monetary policy in a financial bust is not hard to find. Monetary policy typically operates by encouraging borrowing, boosting asset prices and risk-taking. But initial conditions already include too much debt, too-high asset prices (property) and too much risk-taking. There is an inevitable tension between how policy works and the direction the economy needs to take." The concept of a "financial cycle" has a plausible back-story. When times are good, borrowers and investors of all kinds tend to let down their guard, worry less about risks, and gradually become overextended--which can then brings on a counterreaction, or even in some cases a financial crisis. It's easy to point to financial crises, but it's harder to show convincingly that an earlier financial boom is the cause of the crisis. The nice smooth curve of financial cycles above is created by using statistical tools ("filtering") to blend together tBorio is up front about this difficulty and others, and has some suggestions for how the appropriate modeling might proceed. 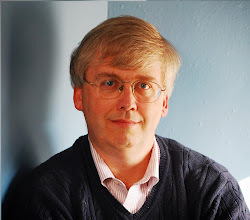 But even if one doesn't buy into the notion of a self-perpetuating financial cycle, standing apart from the regular business cycle, one lesson that everyone seems to have learned from the Great Recession is that rapid expansions of credit and rapid rises in property values have real macroeconomic risks--and thus are an appropriate target for policy.